It's hard to slow down when you are in a duck blind or a goose pit with other shooters. Both hands must work together to perform a perfect gun mount. When "Take 'em!" is called, it is every shooter for himself. The first one who pulls the trigger tends to bag the easiest, closest bird. But if you think about it, maybe you don't want to bag the easiest bird. Maybe a more challenging shot would please you more. So let's think about slowing down. Whether you need to sit up or stand up to begin the shot, move as fast as your body will permit. No need to slow down that aspect of your shooting. The gun mount, swing and triggering is where I'm suggesting slowing down. Maybe you already do. 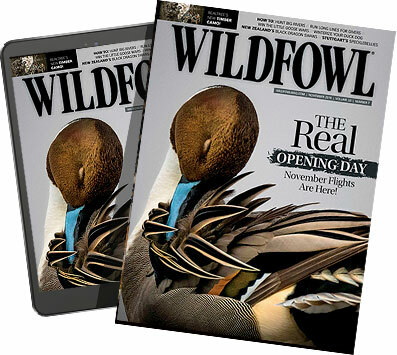 If you do slow down regularly, turn the page to the next Wildfowl article. I know I'm often too fast with my gun mount and swing. I do it despite practicing my gun mount almost every day of my life, even though when I practice, I consciously work at performing slowly. While shooting one heck of a lot of ducks at several hotspots in Uruguay and Argentina this summer, I still had to keep reminding myself to slow down. It is not an easy when ducks are flying every which way -- over, in front of and behind the decoys. When I suggest slowing down, I'm not talking about moving so slowly the birds are out of range before you first hit the trigger. Only a tiny difference exists between mounting and moving too quickly and performing the tasks in a more orderly, slower manner. One of the most common mistakes revealed in a too-quick move to the bird is when the right hand is used too forcefully and not in concert with the left hand. Obviously, I am talking about a right-handed shooter. When the right hand takes over, and it almost always does when you move quickly with a shotgun, the muzzle comes down and away from the target's flight path. You don't want that. Instead, you want a smooth move, with the muzzle starting and staying right on the bird's flight path. No right-handed shooter can achieve that if they allow the right hand to dominate the gun mount. Slowing down a little allows the two hands to work together, not against each other. In past columns, I've dwelled on practicing the gun mount over and over -- starting the muzzle moving on the imaginary bird's flight path first, then blending in the gun mount while continuing a smooth swing. To accomplish it, both hands have to work together. I only shared a duck blind for two days with Missouri's Tony Vandemore, but his shooting move is classic. He can beat his blind mate to the bird anytime he wants, but he looks so slow doing it. Obviously, he's not slow. His move is so controlled, his hands are working together and his movements are fluid. Of course, he kills one heck of a lot of ducks, Canada geese and snows every season, so experience is undoubtedly a huge factor in his performance. For years, Vandemore has shot the same semi-auto for virtually all of his waterfowl hunting. He knows his shotgun so well. No one can say enough about sticking with one gun day in and day out, year in and year out. Let me get back to the gun mount. I have covered the subject in previous Wildfowl shotgun columns. If you still have your copy of the October issue, read or reread my suggestions for using a laser or mini flashlight device in the muzzle of the shotgun. After working on keeping the light right on your aiming point -- mounting the gun for a straightaway target -- the following advice details the way to practice your gun mount thereafter. Make sure both hands are working in concert, with the right hand performing the same amount of work as the left. Start the muzzle swinging along the wall/ceiling seam. Immediately thereafter, start your gun mount, keeping the light beam right on that seam, then finish the gun mount and continue swinging briefly, with the light never wavering from the wall/ceiling seam. It is not easy. Initially, the light beam will be all over the place. Start performing the actions very slowly. Otherwise, you will never get the hang of it. Once you can mount and swing time after time with the light beam sticking to the wall/ceiling seam like glue, speed up a bit. If you practice the technique enough, you'll begin to perform the same way in a real duck-hunting situation. So now you are sitting in the duck blind, waiting for ducks to see your perfect decoy setup. Don't let your mind shift into neutral. Remind yourself to slow down. To work your hands in concert. To start the muzzle moving just before starting the gun mount. And to stare a hole through the next greenhead. While hunting last June in South America, when I missed a duck it was almost always because I did not slow down. Same thing when I walked in on a pointing dog, even when I reminded myself seconds beforehand to slow down, I sometimes fired too quickly at the perdiz that erupted. So on the next point, I would work doubly hard to actually slow down. Invariably, the mental instructions I gave myself paid off. But you can't merely tell yourself to slow down and expect such self-coaching to work. You have to practice it. You perform properly with gun mounting practice at home. Such practice is not drudgery. Make it fun. Convince yourself it is fun, if you must. It won't be long until you are looking forward to gun-mounting sessions. Don't overdo it. I suggest only about 15 practice gun mounts at a time, but try to do it three, four or five times a day. Each 15 gun mount practice session is only going to take a minute or so. What does it cost? Nothing. Gun-mounting practice is one of the best things you can do for your shooting -- and it's free! A big bonus of slowing down is you allow that great computer of yours -- your brain -- to come into play more. As you make your move to any duck or goose, it is obviously necessary for your brain to gauge the distance, angle and speed. It takes only a fraction of a second for your mind to compute, so give it a chance to work on your shooting's behalf. uck, however, it's easy to shoot in front because it does not require much lead, even at 35 to 40 yards. Maybe you can come up with additional benefits of slowing down a little. If you can, let me hear from you so I can pass your thoughts on to other wildfowlers.